Premier Philippine anthroposophists Jake and Bella Tan have just released the schedule for their "15-DAY INTENSIVE BEGINNER’S COURSE IN WALDORF/STEINER EARLY CHILDHOOD EDUCATION for next year (2013)". The course starts on January 17 and will be held every Thursdays-Saturdays thereafter for 15 sessions and will cover introduction to anthroposophy, Waldorf Education and activities integral to Waldorf Education (like playing instruments, wet on wet painting). The course will most benefit teachers, parents, individuals interested in self-development or people at crossroads and wondering what to do next. I took this course early this year and I credit it with a lot of changes that happened to me, and pursuits that I am into now. Yes, life-changing is how I will describe it. A lot about anthroposophy resonated in me... and it has helped me become a more intentional parent which is why I highly recommend it to everyone who can keep an open mind. 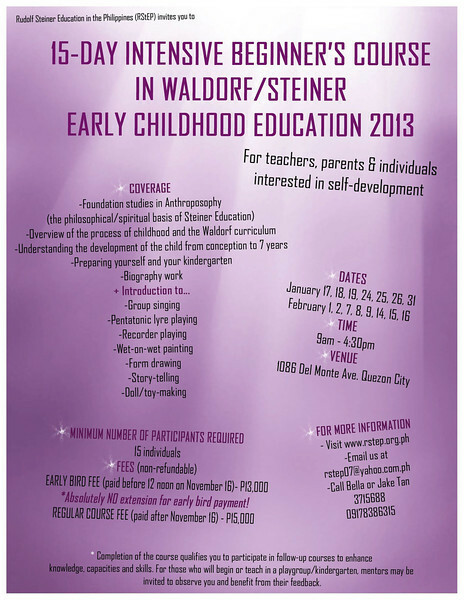 For more information... click on the poster for details or contact us at rstep07@yahoo.com.ph / 3715688 / 09178386315. Thank you!